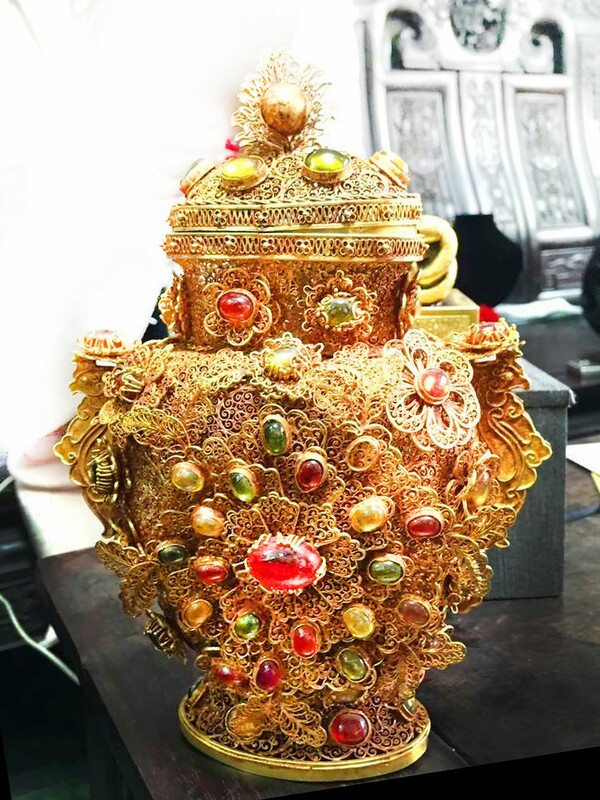 Feature：A gold(1*) vase with filigrees (2*) and gems. 1* Gold in ancient China was a symbol of identity and status, and was mainly used by royalty and nobility as auspicious blessings and exquisite ornamentations, which were ‘in style’. China began to exploit gold as early as the Shang Dynasty. The Warring States Period saw maturation of the gilting technique, and during the Han Dynasty, the techniques for molten gold were mastered to transform them into beads and threads. The Ming and Qing imperial rulers set up gold and silver vessel production workshops, focusing on the delicate filaments and gem embedding, advancing fine gold skills in the "filigree mosaic" to the extreme. 2* Filigree (leisi) is one of the traditional techniques of metalworking (gold), also known as "huazuo" or "huawen". It is the most delicate technique in metalworking, by drawing gold and silver into thin threads before braiding them into a variety of patterns to be welded to the top of other objects. Three-dimensional filigree is the hardest to achieve. It starts with an "ash heap" where charcoal is grinded into fine powder, it it then soaked in baiji grass mucus to create a mold, often of figures or animals. The filigree is then performed on top of the mold. It is then soldered and placed in fire to destroy the mold. The final product is a hollow and exquisite fine piece of art. The gold filigree is the most precious due to its difficulty. There have been hundred thousands of filigrees sold, most of which were jewelry. The highest grade of filigree jewelry was undoubtedly the emperor’s crown. Other objects include palace ornaments, such as the valuable royal vase which was also decorated with gemstones.